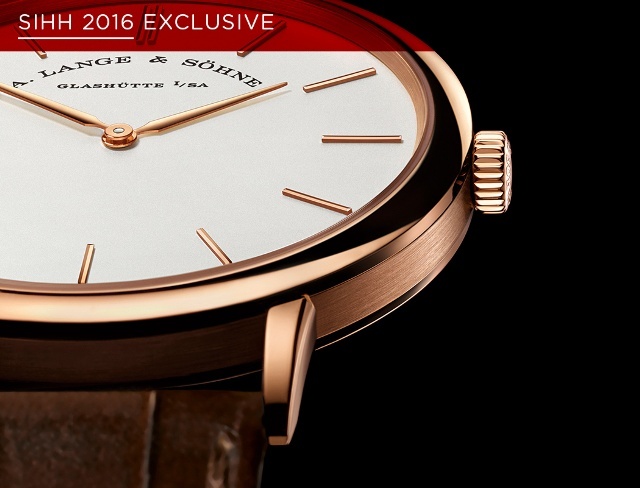 For 2016 A. Lange & Söhne adds seven new timepieces in addition to the 1815 Tourbillon Handwerkskunst we showed you in December earlier. 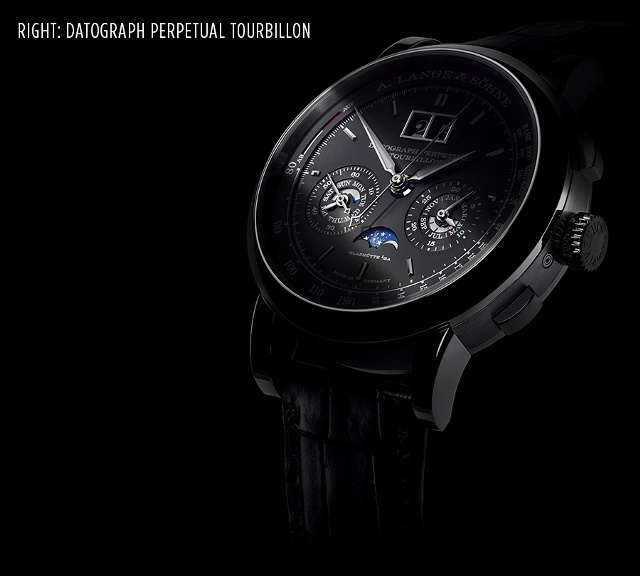 These include two perpetual calendars, each with a tourbillon. In addition, the Glashütte company adds a white gold Lange 1 with luminous hands, two Saxonia updates and a special Richard Lange Jumping Seconds watch with a constant force escapement. Below we’ve assembled these seven new timepieces with a short description of each. We’ll have more about these watches as the SIHH continues this week, including which of these models makes our best-of SIHH 2016 list. This column-wheel chronograph with flyback function, perpetual calendar and tourbillon is limited to 100 watches. It pairs three complications with five supplementary functions–all nicely organized on the dial for easy reading. For the first time in an A. Lange & Söhne tourbillon with chronograph, this model beats at a more traditional 18,000 instead of the conventional 21,600 bph. As a result, stopped times can be displayed with one-fifth of a second accuracy. Of course, Lange’s patented stop-seconds mechanism instantaneously brings the balance wheel inside the tourbillon cage to a standstill when the crown is pulled. This allows the watch to be set with one-second accuracy. Presented in a limited edition of 200 watches, the Grand Lange 1 Moon Phase Lumen combines a moon-phase display with a luminous large date. You may recall the 2013 Grand Lange 1 Lumen that featured semi-transparent sapphire-crystal dial with an ingenious luminous large date disc configuration. 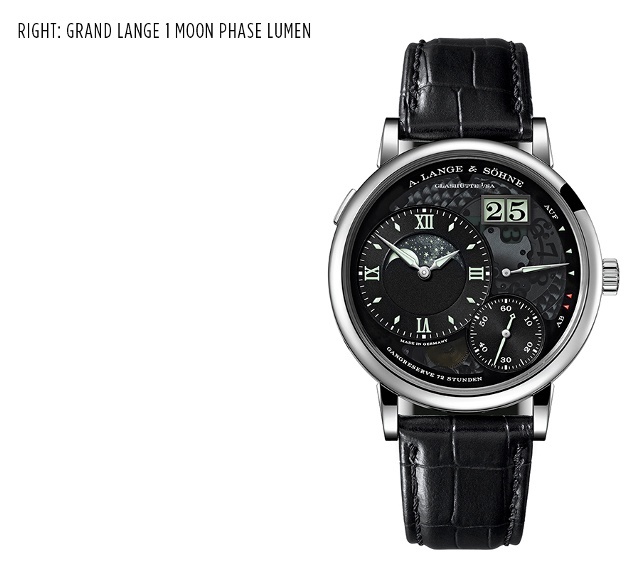 It was followed a year later by the Grand Lange 1 Moon Phase with a prominent in-dial moon-phase display. This new edition combines the specially made luminosity and the in-dial moonphase display. Different from Lange’s previous moon-phase models with solid-gold lunar discs, the Grand Lange 1 Moon Phase Lumen has a disc made of glass. Presented in a limited edition of 200 watches, this model comes in a 41-millimetre platinum case. 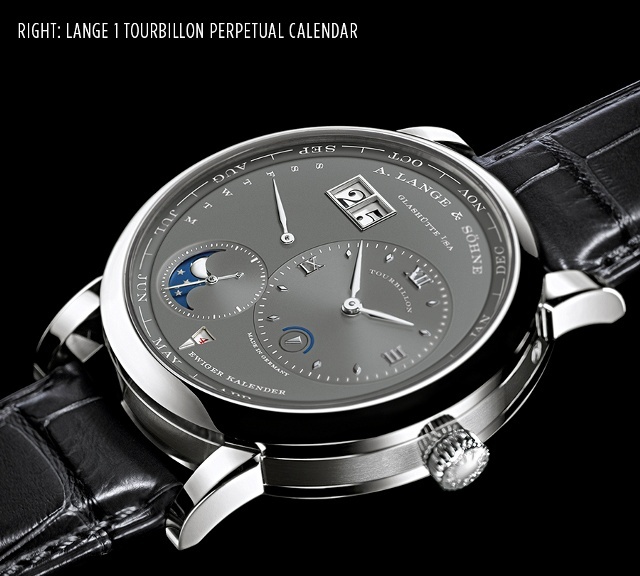 This second perpetual calendar adds a white gold case and grey dial to the Lange 1 Tourbillon collection. It combines two classic complications: a well-known A. Lange & Söhne calendar with outsize date, plus a retrograde day-of-the-week and leap-year displays and a peripheral month ring. The tourbillon? Check out the subtle description just beneath the 12, turn then watch over and prepare to be dazzled. All of the perpetual calendar displays advance instantaneously. According to the company, the mechanism is designed in such a way that it must be advanced only by one day in the year 2100. And the moon-phase display, located inside the subsidiary seconds dial, will even run true for 122.6 years before it needs to be corrected by one day. 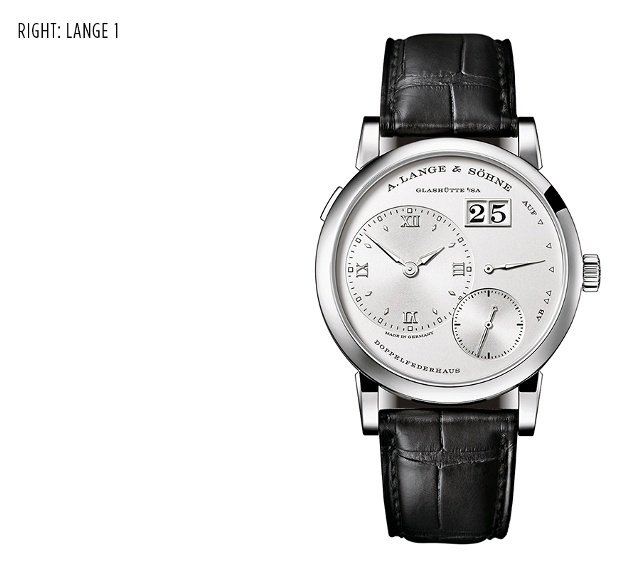 After the successful introduction of a new version of the famed Lange 1 last January, A. Lange & Söhne this year extends the LANGE 1 family with this 38.5mm white gold model with luminous hands and hour markers. The watch’s Caliber L121.1, presented last year, adds an instantaneous jumping large date to the family. Here A. Lange & Sohne combines two mechanisms that functionally complement each other: A one-second constant-force escapement and a jumping seconds mechanism. In addition, the watch features a zero-reset mechanism, equipped with a multi-disc clutch, to allow for quick synchronization. When the crown is pulled, the seconds hand jumps to the zero position. This 39.9mm platinum timepiece is being launched in a limited edition of 100 pieces. 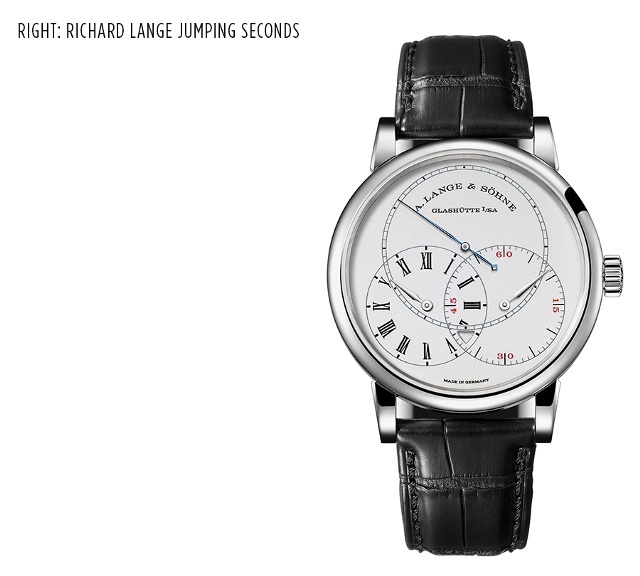 The Richard Lange collection, begun in 2006, is the A. Lange & Söhne’s collection that aims to add new facets to the scientific observation watch. 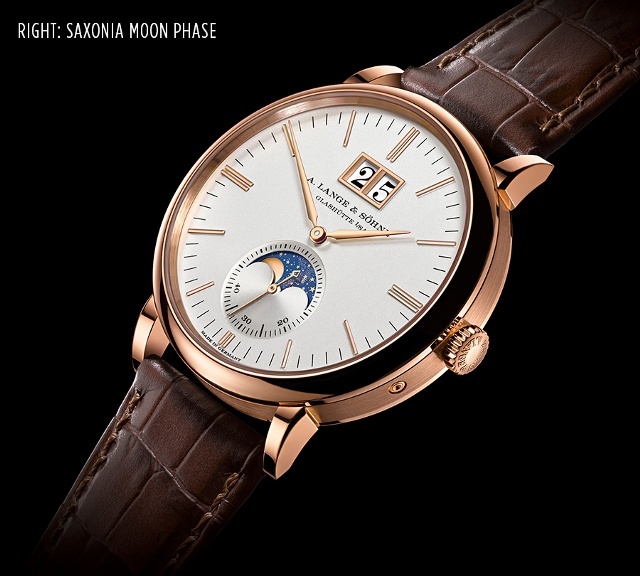 The latest model of the Saxonia family combine a precise moon-phase display and the characteristic Lange outsize date. The self-winding calibre L086.5 inside the new watch is the firm’s sixteenth movement with this popular astronomical complication. The display is connected to the hour-wheel continuum so, just like the moon itself, it is always in motion. It reproduces the period from new moon to new moon with an accuracy of 99.998 per cent, thanks to a precisely calculated seven-stage transmission. Once set, and assuming that the watch runs continuously, the display only has to be corrected by one day every 122.6 years, according to the company. A special Lange patented coating process created the dial’s intense blue tone on the solid-gold lunar disc. A laser is used to cut out no fewer than 852 stars. 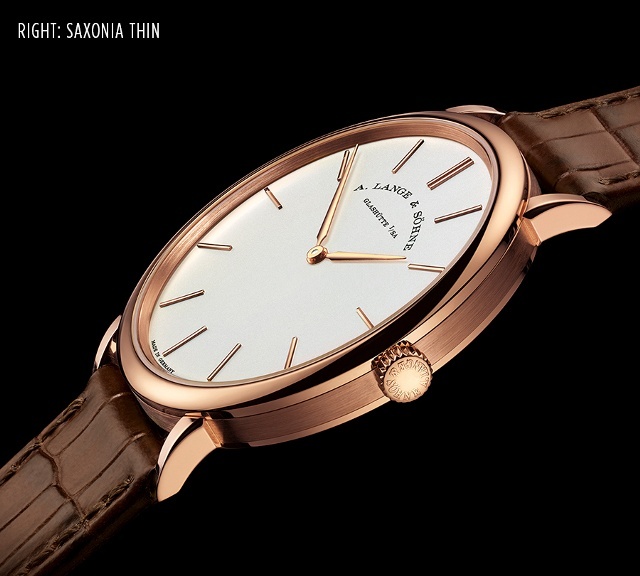 The Saxonia Thin offers a newly designed dial and case that is A. Lange & Sohne’s thinnest timepiece. Recall that in 2011 A. Lange & Söhne created the first Saxonia Thin, but here the slim two-hand watch offers a version with a reworked dial to better reflect the current design of the SAXONIA watch family. Compared with the predecessor model, the solid-gold baton hour markers have been slightly elongated and shifted closer to the bezel. The retouched solid silver dial radiates harmony. The new edition of the Saxonia Thin has the familiar case diameter of 40mm and a height of 5.9mm and is available in pink or white gold.